Published December 6, 2016 | By Priscilla Archangel, Ph.D. The ability to understand and manage one’s own emotions, and to recognize and influence others’ emotions, is a critical leadership skill. It can make the difference between marginal accomplishment of a goal, and engaging the hearts and minds of team members to uncover innovative and game changing solutions that exceed expectations. Emotions represent the Heart in the Head + Hands + Heart equation of leadership. It’s where leaders demonstrate that they care about and can connect with others. The emotions of individuals can either activate and motivate the team, or move them to disassociate from the goal and passively comply. Leaders who engage the capabilities and skillsets (hands), and intellect (heads) of their team; but fail to engage their minds and emotions (hearts) will find that there’s a missing link to maximize performance. Published March 11, 2016 | By Priscilla Archangel, Ph.D.
What is the leadership trait that is most admired by others, most desired by leaders themselves, and most required by senior executives for their teams? Its importance applies not only for current, but for future success. It transcends geographies, cultures, and generations. Its meaning has global significance, but may vary in its local application. This most admired global leadership trait is Inspiration. Why does Inspiration rate so highly as a desirable trait? Each of us should be able to think of a leader with whom we’ve worked who we would define as Inspirational. In many cases, being around such a person made us perform better, stretched our creative abilities, and encouraged us to do something we would not have otherwise attempted. These leaders attracted others to them, and sparked thought provoking conversations. Their styles probably varied, but their authentic approach to leadership made a meaningful difference. Too often, leaders are focused primarily on themselves or their tasks. They become caught up in their power, their position, or business problems to be solved. They expect employees to independently be self-motivated, results focused, and to understand the purpose of their work. Instead, Inspiring leaders focus on others. They cast a vision of the future, connect people with it, and coach them to high performance. Inspiring leaders elicit a positive emotional response from those they interact with, that draws others to them. People want to join their team, and become a part of their successes. They truly believe that people development is the key to organizational success. Published October 29, 2015 | By Priscilla Archangel, Ph.D. Earlier this month I had the opportunity to attend the TEDx Detroit conference. TED stands for Technology, Entertainment and Design, and is a gathering of leading artists, entrepreneurs, educators, designers, thinkers and doers who share their “big idea” worth spreading. Meeting in locations all over the world (the x factor), this Detroit gathering included people who offered bright ideas in a variety of areas. Here is a sampling of the ideas presented. Paul Elio of Elio Motors believes that mobility is one of the primary roadblocks to individuals getting a job and thereby overcoming poverty. So he designed a 2 seater vehicle (one seat behind the other) priced at $6,800 that gets 84 miles per gallon. While that price seems very reasonable, he went a step further and devised a financing plan whereby the purchaser uses an Elio Motors sponsored gas card, and each time they get gas, he charges them three times the actual amount. This overage is applied to the principal cost of the vehicle, making it self-financing. Alden Kane is a high school senior and student inventor. He’s committed to improving peoples’ lives by combining science and service, and believes that proprietary ideas are the future of science. And so he accepted a challenge to design a “wheelchair stroller” for a local mother. Sandwiching time to complete this between his academic and extracurricular activities, he came up with a novel solution to a common problem for millions of new parents who are confined to wheelchairs. Now he’s looking for angel investors, and a more user-friendly name for his invention. Elizabeth Holmes hates needles. To her, the idea of being poked by a needle and withdrawing blood is more than just unpleasant. When she knows that she has to give blood, she becomes consumed and overcome with the thought until it’s finally over. So it should be no surprise that at age 19 she founded Theranos, a ground-breaking blood diagnostics company that 11 years later is worth more than $9 billion. The company has patented its secret technology of performing 200 different blood tests (soon growing to over 1,000 different tests) without using a syringe. They use a few drops of blood drawn using a finger stick to minimize discomfort, and collected in a “nanotainer”; a container the size of an electric fuse. Her board is stocked with powerful blue chip members including former cabinet secretaries, former U.S. senators and former military brass. Theranos’ innovative technology is poised to transform health care technology at no more than half the cost of similar tests using current technology. Holmes leveraged a process that irritated her to innovate a new method of getting it done. Tony Fadell was building a vacation home for his family. One of the seemingly mundane decisions was selecting thermostats, but he wasn’t satisfied with his choices. So he developed the Nest Learning Thermostat, a digital and WiFi enabled device that conserves energy by learning its owners’ habits. He also designed the Nest Protect which uses new technology to detect smoke and carbon monoxide. Fadell’s real goal is to use technology to redesign and control all technology in the home. He was successful in raising startup capital as a result of his Apple pedigree, and extensive connections in Silicon Valley. He previously led the team that created the iPod, thereby rejuvenating Apple and transforming the music industry (yes, I love iTunes), and assisted in the development of the iPhone. Fadell left Apple in 2008 (along with his wife who was an HR executive there) and his thermostat irritation became the epiphany to innovate his next career move. As evidence of his success, Nest was purchased by Google earlier this year for $3.2 billion. Holmes and Fadell were irritated by processes and technology that others accepted as status quo. Obviously this wasn’t just a minor irritation either. Most of us would have dismissed it, avoided it, complained a bit while it was on our minds, then moved on to what we believed were more important things. We would think that change wasn’t needed, or that technology couldn’t effectively be applied to it and scaled for use. Instead, they saw it as a challenge and took the opportunity to do something about it. They had a mindset for innovation that they applied to their environment. At the time, Holmes was a sophomore at Stanford, and according to her chemical engineering professor, viewed complex technical problems differently than other students. She dropped out shortly thereafter and persuaded her parents to invest her education fund into the business start-up. Fadell’s tenure at Apple was distinguished by asking lots of questions, challenging Steve Jobs, and building his network in the “valley” outside the company; something normally reserved for Jobs himself. He didn’t conform to the typical concept of the Apple executive. So what is the key to your innovation? What is it that irritates you, but you find it difficult to simply walk away or ignore it. Instead, you keep trying to figure it out. This may be your opportunity to move from irritation to innovation; to find new approaches to address old ways of doing things. Though Holmes and Fadell applied innovation on a large scale, you can easily do this within a smaller sphere of influence; in your work team, organization, community group or family. Here are a few simple steps. Tap into what’s irritating you. What problem needs to be solved? Chances are it’s right in front of you. Find the benefit. Who will it add value to? Identifying your stakeholders will help you to target what action to take, and encourage you to stick with it for their benefit. Ignore the naysayers. What do you believe is possible? If you don’t have faith in yourself, no one else will either. Identify all the assumptions associated with the status quo. Why do people do it this way? Calling them out individually helps to break the innovation opportunity down into workable sizes for better analysis. Methodically challenge each assumption. Why? Why? Why? Why? Why? By the time you’ve asked “why” five times, you’ll uncover some suppositions that really don’t have a strong foundation. Think of a new approach. What if we did it this way instead? Then think of another different approach. This practice gets you into the mode of change. If you’re really irritated, true innovation will typically involve transformation, not evolution. It will yield a totally unexpected outcome that represents a leap ahead, not just a step forward. So embrace that impatience and exasperation with the current situation, and press forward to a new mindset of innovation. Read the articles on Elizabeth Holmes and Tony Fadell in the June 12, 2014 issue of Fortune. Published January 24, 2012 | By Priscilla Archangel, Ph.D.
What is the fundamental element of existence? How was the universe created? These are the ultimate questions for scientists to uncover. Centuries of study and billions of dollars have been spent in attempts to understand these basic, yet complex, questions of life. Many theories have been presented, including one in the 1960s by physicist Peter Higgs and a team of scientists. In their search to understand how particles get their mass, they developed a theory that the Higgs boson, a subatomic particle that no one has ever even seen, is the key to understanding how the universe works. Since that time, scientists have worked to prove the theory, and as a recent article on CNN.com reports (What is the Higgs boson and why is it important? ), they have now found an indication that the Higgs boson particle actually exists. Because this particle is believed to exist everywhere, yet it has never been seen, it eventually got the nickname of the “God particle”. 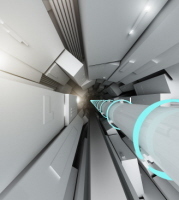 Their research is being conducted by smashing protons against one another in the $10 billion Large Hadron Collider (see photo) in Switzerland. Interestingly, as exciting as it may be to finally uncover the Higgs boson, if they don’t see it, this contradicts decades old approaches to understanding the universe, and our existence may be even more complex than originally thought.